How did you manage your stress level on voting day? I managed mine by fleeing the country! I joined Vicente, one of our ministry partners, in Mexico on some all day outreaches he does each week with the bread we bring to him. It was such a blessing to see first hand what Vicente has been telling us about. Mind you, he knows probably less English than I do Spanish, so we are quite the pair. But we have fun figuring out what each other is saying, and above all, we just love what God does in the midst! Vicente had been telling us about “the people who live under the doors under ground”. I always thought, ‘wow” what could he be trying to tell me? Well, I got to see first hand! 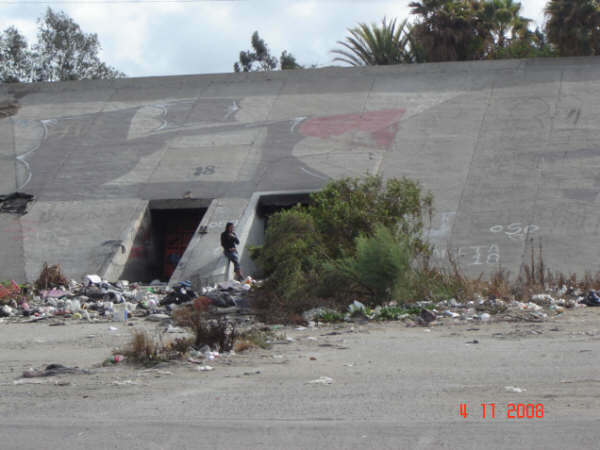 We drove down into the concrete canals or aqueducts of the Tijuana river were people live in the tunnels behind the levee doors (pictured above left). Many of these are drug addicts and many are deported immigrants or both. As we arrived, the driver of our vehicle would shout out “free sandwiches” and those interested actually began rolling out from underneath some of the propped up levees! It was surreal as I realized there was an entire underground (literally) culture of really broken people. It was the closest I had ever come to those who literally live on trash heaps. The trash, the smell, the filth of the sewage water were all indicators of why I may not want to hang around there long. But after seeing the sunken eyes of the human beings that lived in the midst of it, I got a second wind and renewed passion to assist feeding and praying for them. One guy (pictured above right) was actually going through withdrawals and desperately crying out for help from us to help him get off the powerful drug of heroin. Another guy was in the process of shooting a syringe into his neck, when we walked up to him, so he just left it hanging there as he took the sandwich and allowed us to pray for him. I will never forget that scene. Several others, coming across to meet us on the other side, attempted to leap the path of sewage flowing down the canal only to still land one foot in the contaminated water. I myself did the same as I skipped across a couple of tires to bring a sandwich to a lady who feared crossing the waters. As we drove away from there, I was left with the stench of my own wet feet to serve as a reminder of the conditions that these human beings live in everyday. Though some may be addicts, some may just be having hard times. One example is a man named Franciscan, who I prayed with. Franciscan explained in good English that he had lived in Oregon since he was 2 yrs old, and made a mistake at the job where he worked as a non-citizen which resulted in his deportation. He had no idea what to do in Mexico, having never been there in his adult life. He did not know where to live or how to even survive in Mexico. 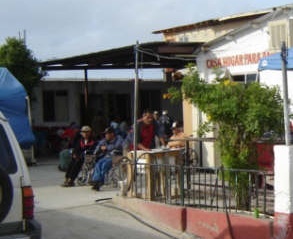 After the aqueducts, we also visited a place where elderly people (the elderly in Mexico, are called, ‘antigua’s’) live. In Mexican culture, the elderly would normally be taken care of within their own family. However, these 120 antigua’s had no family at all. They are being cared for by some special folks at this ‘Casa Hogar Para Antigua’. Unfortunately, the recent violence in Tijuana, affecting the climate for visitors and tourists, has prevented food sources normally brought from the U.S. to this home. Vicente delivers bread here after we bring it to him. Our current economy has also affected the amount of donations we get, thus these dear ones are lacking as well. At times, they may only have one meal a day provided. When we arrived with a few small bags of bread and a single small bag of pastries, Vicente began to spoon out small portions of the pastries into cupped hands of each person sitting around in their wheelchair (pictured above right), or on their bed. Again, a surreal picture of those who may have been forgotten – but not by the Lord. It stirred a greater passion in me for discovering new resources for donated food, so that I could get it to Vicente to distribute. Finally, we visited a facility where the extremely ill are cared for. This is not a hospital, but it is for those in need who are very sick and have no funds to be cared for in a hospital. Many were elderly but a few were very young. One young man I prayed for had HIV, and he appeared to be extremely close to death. He just looked like skin stretched over bones. As I placed my hand over his, his only effort in return was to look into my eyes. I prayed that he could see my hope and faith for him as I prayed that Jesus would comfort him. The building they were in was really just a large garage, so it was full of gaps in both the walls and ceiling. As it was a very cool day, many of them were covered in thick blankets for keeping warm. As I prayed with this desperately sick young man, I thought to myself, the last thing he needed was to experience the cold that could so quickly be remedied by a warmer building. Please join me in prayer for the ongoing needs that I have shared with you here. Thank you to those who responded to our request for 15-20 partners of $100 monthly gifts. We received about a quarter of our goal for this support so far. Please know that a gift of any amount is much appreciated. Remember we can give tax deductible receipts for 2008 until December 31st. We pray a wonderful Thanksgiving season for you and yours. To see all the photos from this outreach click on TJ River Outreach under Links. p.s. Last month I mentioned telling you more about Human Trafficking in this report. I bumped that to next month as I was excited to share this recent outreach with you! Wayne, thank you for putting this out where people can see the depth of the problems in Tijuana. I’ve seen some tragic things there over the years when we ministered in that area, but I never ventured into the stench of the Tijuana river. I had no idea that people were living in those tunnels. This really touched my heart. Lord Jesus, bless Vicente and every person he meets there, and bless Wayne and the City of Refuge for sending the food where it is needed the most. Let the kingdom manifest in the Tijuana River area, and make it like the garden of Eden, full of salvation, healing, and miracles of faith and provision. In Jesus name, amen.